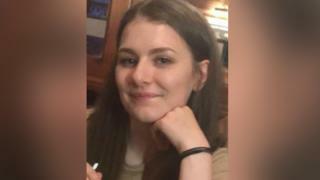 The mother of Libby Squire says she has lost "one of the most precious things" after her daughter's body was pulled from the Humber estuary. Her death is being treated as a "potential homicide" and a man remains under investigation. Lisa Squire posted on Facebook she was "so sorry she could not keep her safe" on the night her daughter vanished. She wrote: "My baby girl is gone. Gone forever. No more birthdays with us. No more Christmas Days with us. No more family time all together. "No family should have to endure that." Mrs Squire, from High Wycombe, Buckinghamshire, said she was "broken" for all the people who knew and loved her daughter. The "worst point" was having to tell her daughter's boyfriend Connor: "I am so sorry the girl you love the most in the world has gone". "I cannot thank you enough my darling Pie for making me a mummy. For choosing me to be your mummy. It's an honour, a privilege and a joy," she wrote. Detectives have said she could have been killed but "would not be releasing results of a post-mortem examination for investigative reasons".